The Hockey Writers Nashville Predators staff writer Colin Fitts will evaluate the performance of each player on the 2014-15 Predators roster every weekday in alphabetical order. You can follow Colin on Twitter, @FittsTHW. Highlight of the Year: Roman Josi’s late first period tally in Game 2 against the Chicago Blackhawks was his flashiest goal of the 2014-15 season. With the score tied 1-1, his goal helped push Nashville to a 6-2 win and to tie the series at 1-1. 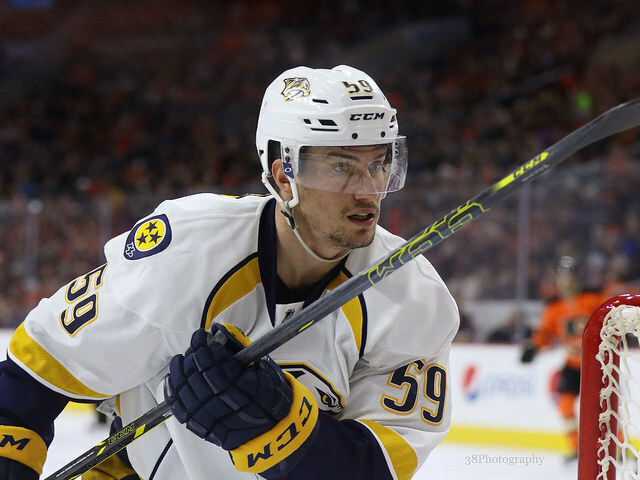 Strengths: Josi had a breakout year in 2014-15, and he can only improve from there. His 55 points last season ranked fifth most among all NHL defensemen in scoring. After the all-star break, Josi scored 27 points (8 g, 19 a), second most among NHL defensemen. Most of that offense was generated by Laviolette allowing him to move the puck up the ice. Josi is the one of the best puck-moving defensemen in the NHL. He can finish the rapid attack with his accurate shot. Not only is Josi good offensively, he is reliable defensively. He placed second in the NHL in blocked shots (209). Josi’s 26:28 of average time on ice per game was the highest on the Predators and ranked fourth most in the League. Weaknesses: Josi was not as strong defensively without his counterpart Shea Weber. It was obvious in the final four games of first round series when Josi was a -4. Together, however, they are the best defense pairing in the League. What to Expect Next Season: Josi had a Norris Trophy caliber season. But because the award has turned into the “best offensive-defenseman award,” Josi was not a finalist. Now that everyone knows Josi is on the rise of becoming an elite defenseman in the NHL, he should get the recognition he deserves next season. * – Stats by Ray Harris.